It’s how we were designed. It’s what we do. Use the menu below to sort through projects by type. Click on a project profile to read the full brief. We gave Vanguard Environments a makeover to catch the eyes of humans and computers. We tripled business opportunities using only 1 brochure. We turned Cronan & Associates and their lines into superheroes. Our team wrote Vanguard Environments’ 1000-word story with just a picture. The IIDA (TX-OK) needed some caffeine for their online registrations. 6 Steps to Get Rich using Kusak Wealth Management’s Sales Tools. 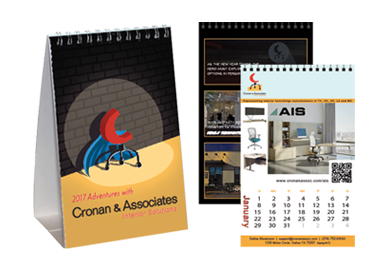 Problem: Cronan & Associates delivers incredible interior solutions to their clients by providing a variety of planning tools and product options, but those items weren’t easily-located on their website. Their team members needed these to be accessible to better serve their customers and business partners. 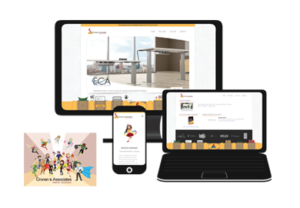 Solution: By employing their new superhero branding, we revamped their website design and created a custom Utility Belt to highlight key user tools such as a Budget Calculator, Purchasing Contracts, and a Resource Library. Cronan & Associates, now armed with a high-powered website, has the competitive edge to stand against their competition and the Interiors of Doooooom. 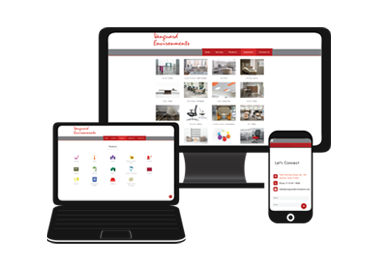 Problem: Vanguard Environments came to us with a general idea of what they wanted to communicate on their website: their position as an industry resource and primary connection for furnishing office environments. The dealership recently changed ownership after 24 years in business. They knew they needed a digital marketing makeover but didn’t have a clear picture of what they should have or what was possible. Solution: We developed custom content for their website, expanded on existing content, and redefined their brand as a true resource for the industry. 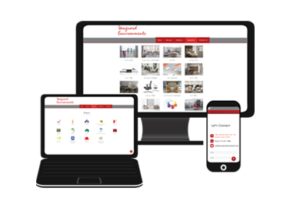 The website was restructured to generate deeper user engagement, and an SEO foundation was developed to support long-term growth of their digital marketing presence alongside their direct operational and sales growth. The new website served as a platform for planning additional tools and testbed for future branding exercises. While Vanguard Environment’s problem was broad, we implemented specific plans to deliver clear, effective possibilities through purpose-built marketing. Problem: Pioneer Contract Services needed to grow their brand awareness by communicating how their strong divisions are what made it possible for Pioneer to reach its 45th anniversary milestone. 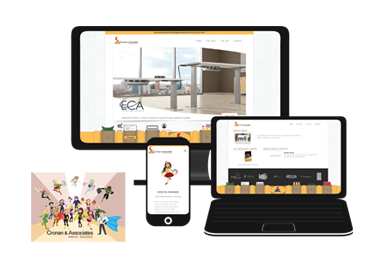 Solution: We developed a brochure and presentation package that works together or separately with new and existing components. 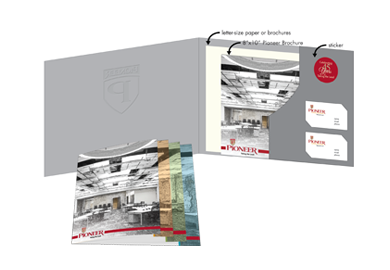 The layered architecture of the brochure celebrates the layers of their business while providing individual sections to feature each division. Physical and digital marketing materials were designed to work with any literature and materials they currently utilize as well as what they might develop in the future. 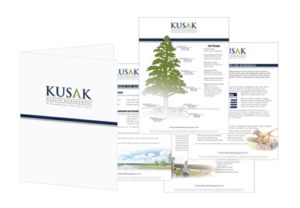 These marketing materials allowed team members in each division to effectively communicate how they provide strength to the Pioneer brand, value to their clients, and growth for the future by working together. 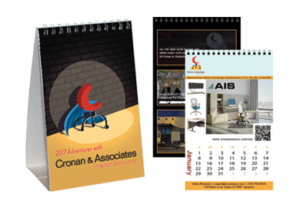 Problem: Cronan & Associates is a unique rep group for highly-versatile, commercial interiors where each team member is known for their superhero-like abilities to support their clients. Their management approached us to create something new for their annual desk calendar because the ready-made, stock templates didn’t display them or their lines effectively. Solution: Our custom desk calendars provided the solution they were looking for: compact size, large-image display, and easy-to-read text. The new version pulled everything people had come to expect from their sales team while delivering more value to the Cronan & Associates brand. More space was given to a Manufacturer of the Month and to feature a line each month, more room was added to highlight representatives of each individual territory, and feature pages were added for their new showroom and digital catalog. 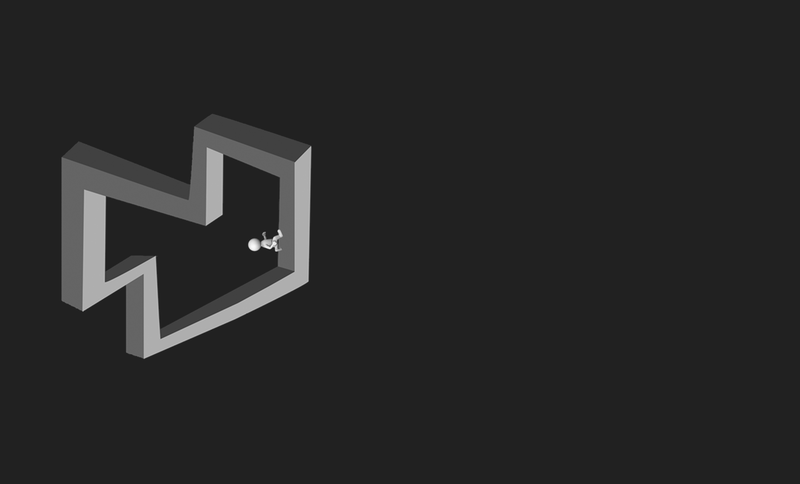 This project also made it possible to tease the launch of their new, super website design. Problem: Humanscale has stylish, customer-centric approaches to ergonomic furniture that are clever, attractive, and incredibly useful. They came to us in search of new tradeshow marketing swag that would have an accurate showcasing of their brand and specifically connect with their female demographic. 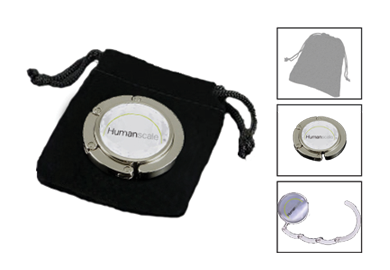 Solution: We took the Humanscale belief that “the best designs are based on purpose and function” and illustrated it in full-color, collapsible, branded purse hooks. 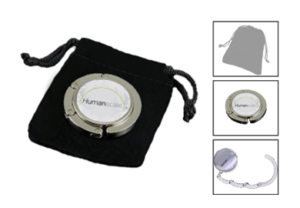 These resourceful, smart, pragmatic trinkets offer a new approach to conventional sales giveaways and mirror Humanscale’s take on convenience, performance, and customer satisfaction. This also proves that purpose-built marketing delivers strong gains through being in line with how your business does business. Problem: A company’s brand is its very essence, and Vanguard Environments wanted to make something timeless, strong, and chic. They wanted their branding and logo to address multiple applications and handle anything they could possibly branch into in the future. They also needed to communicate the standards for their logo to their sales and PR teams and have it tell the story of Vanguard’s elegance, connection, 3D relationships. Solution: We created a comprehensive plan to address all of these concerns and more. We picked serif fonts and tweaked them to convey a classic typesetting motif. The logo’s V and E provide a light 3D effect (nodding to their philosophy on client relationships), and a monogram and full-text version were designed to allow that versatility of application. The color palette we chose illustrates Vanguard’s brand strength, sophistication, and passion; the proportional usage of these colors and logos in physical and digital marketing materials communicates a sleek, modern design and allows the content to dominate over the aesthetics. Problem: If you have an event that can benefit a lot of people, you want people to know about it and go (especially if its free). KSM Resources had just that, and they came to us to help get the word out. 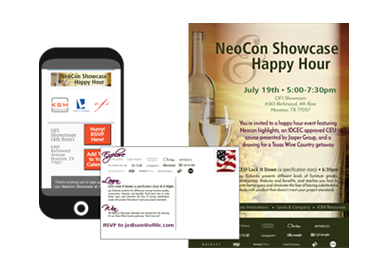 It didn’t help that the event was to be held during the weeks following a major trade show, thus flooding the inboxes of their target audience with mass-mailings. Getting it to the right people seemed impossible to KSM Resources. Solution: Their materials needed to be like nothing anyone else was sending; it needed to pop. We attacked the problem by designing a purpose-built social-media and graphics marketing package. Physical and digital graphics were designed to work in multiple formats and means of delivery. 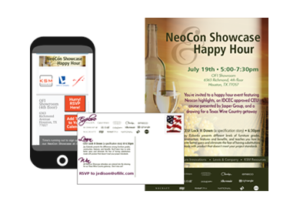 All materials drove people to the e-blast that had an RSVP program built-in and a calendar scheduler that worked directly with e-mail platforms. Our efforts resulted in significant engagement, and registrations for the event skyrocketed past their expectations. Problem: The annual Student Conference from the International Interior Design Association’s Texas-Oklahoma Chapter hosts interior design students and professionals from around the country for a wealth of professional-development exercises. However, the event leaders needed help capturing registrations within their existing framework and communicating with students, educators, industry professionals, and underwriters. Solution: We addressed the issue from two fronts: participants and sponsors. 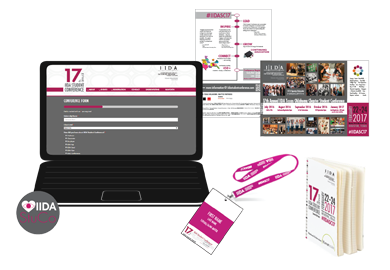 A complete graphics package was developed for sales and marketing, event promotions, and general information at the conference. 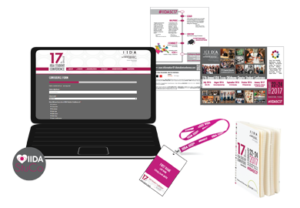 A custom form was implemented to guide conference-goers through the registration process while capturing necessary metrics and event selections for the organizers (for later SEO purposes). Modifications to the events and sponsorship pages provided feature space for sponsors in multiple places (with traffic directed to their webpages through improved SEO frameworks). We managed the logistics of regular content updates (event information, weekly underwriting, presenter information, etc.). We also recreated the registration form that simplified the registration process and improved pre- and post-event planning. Our comprehensive development plan helped garner new vendors for exhibition and sponsorship and assisted in connecting a wide range of accredited interior-design programs across the country into one place. Problem: Kusak Wealth Management has their clients’ trust and well-being as their core values. They wanted to provide something to their new and prospective clients that would guide them through the wealth-management process in plain-and-simple form. Solution: We took their message of growing wealth and designed the initial-meeting literature around the growth of the tree featured in their logo. 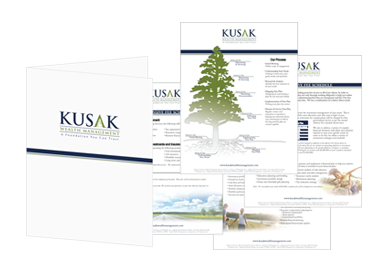 The specified colors and graphic components were chosen to highlight the expertise and subject-matter authority found in the Kusak team. 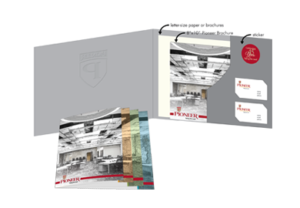 These components continue throughout the information sheets and packaging, thus making it possible to communicate the overall message of strong, consistent growth from the ground up to their prospective customers.